This sympathetically restored farmhouse provides a perfect Holiday base for 1-2 families, parties etc, or spacious flexible accommodation for smaller groups. Balconies for breakfast and dinner overlooking the valley. It offers peace, privacy and fun. The secluded pool provides a natural focus and popular activities such as tennis, riding, golf, and bicycle-hire are all available. Toulouse is the nearest international airport. Other attractions include Rocamadour, Albi, the dramatic 'Gorges du Tarn', the Pyrenees, canoing on the Lot, Aveyron and Cele rivers, the wines of Cahors, restaurants, truffles, pate de fois gras etc. There is table tennis in the house, a cleaner is available at an extra charge. One of the twin bedded rooms can act as a dormitory and sleeps up to 4 with a cot also available. I am a portrait painter and my husband is a shipwright (restoration of wooden boats), We live and work in Cornwall and have three small children. We have had some very special times at Gleyaire. Memories never to be forgotten, and hope that others will enjoy it as much. The house appeals because of it's utter privacy, and romanticism. One really feels as if one is in the elements with all the insect life and wild flowers surrounding it... not a house in sight. It feels as if many good times have been enjoyed here over the last few hundred years. Gleyaire has always been a happy place, and somewhere to go for peace and refuge. Believe it or not, many people have met and fallen in love here, and I can see why. All the bedrooms, bar one, open with french windows out onto the garden which is utterly secluded. It is good to wake up, open the shutters and walk straight out into the garden. 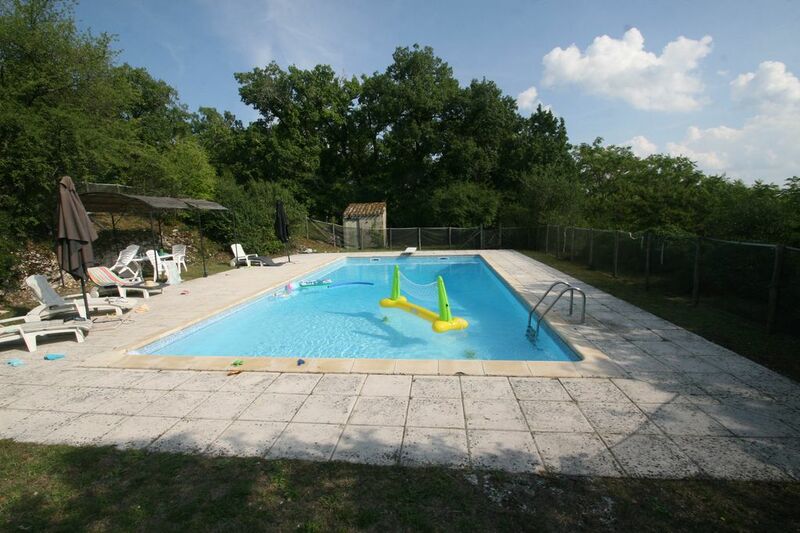 The house is in a beautiful unspoiled part of South-western France, and is on different levels, so that it does not feel too large for 4 or 6 people, but is also lovely for parties of two or more families or mixed age-groups. It is comfortably furnished and equipped for 12 people. Set in its own 2.5 acres, it has a happy, spacious family feel, with the pool and surrounding woodland providing a natural focus. For older people, one en suite bedroom and the middle level of the house are directly accessible from the lawn outside. Long winter lets sought (November - April) at the very competitive rate (for long let only), and as such suitable for house-hunters and/or those wanting to get away from it all. The Belgian family at the bottom of the drive have horses and he is a very good chef. They are extremely hospitable and might offer cooking or riding services for a fee if they are about. Cot and high-chair available. I would really like to be able to leave a positive review for this lovely looking house, but I can't because we never got there. I booked La Gleyaire in May 17, but, on the afternoon of Friday 4 Aug, 5 days before we were due to leave UK for a ferry then to drive down to Toulouse, I received a phone call from Mrs Massey saying that she had double booked us over someone who had booked last year. All credit to her, she said had found me another house (Tissendie) but, she commented, it was unfortunately not as nice as her own. And she said she would pay the owner direct if I wanted to take it. I therefore contacted the owners of Tissendie for photographs and details; it was not yet officially "on the market" and it certainly was nowhere near as nice as La Greyaire....I certainly would not have chosen it for a memorable holiday. Furthermore it was more expensive than La Greyaire. As I wanted to avoid a completely ruined holiday, I therefore spent a frantic weekend looking for somewhere else. Amazingly (remember this was high season) I found a property which (a) was available (b) was suitably old, quaint and lovely, and (c) had the requisite bed arrangements for 8 adults and a dog. This turned out to be more expensive than La Gleyaire but not as expensive as Tissendie. Good news, I thought. So I told Mrs Massey. However, she declared that she was not prepared to pay the extra towards the new property I had found....it seems she was under the impression that Tissendie would cost about the same as her own property. But this was not the case. She therefore contacted the owner of Tissendie and managed to get his price down to the same as hers. She then gave me the option of taking that or she would give me a full refund, saying, on 6 Aug that " Just to clarify, you were offered alternative accomodation which would normally be £1000 more than Gleyaire at no extra cost or a full refund with enough time to source somewhere else to stay." So, with 3 DAYS LEFT BEFORE WE WERE DUE TO SAIL, after putting me through SERIOUS distress, anger, anxiety and work, I was left with the options of taking an inferior property (potentially ruining the holiday) or of cancelling (which WOULD ruin the holiday), or of finding my own. She washed her hands of us and left us to our own devices with nothing more than an apology. I am really glad that Nigel L. is unable to leave a positive review of La Gleyaire, as having had to deal with him, I am relieved that he never set foot in my property. Yes, I am afraid that I did make an administrative error in double booking La Gleyaire. This, I have since discovered by speaking with other owners, is not a completely unusual occurrence. It even happens in the hotel trade! The moment the error was discovered, which was with quite short notice, I took full responsibility and found Nigel alternative and superior accommodation nearby. I was in a difficult and embarrassing situation, but had found a solution and was extremely apologetic. I offered Nigel this alternative or an immediate full refund. Nigel's response was to become aggressive and rude. He was so intimidating and abusive on the phone that I had to stop communication with him and get my husband to talk to him instead. Due to his aggression and threats of legal action I did make the statement that he "had been offered a superior alternative or full refund". I apologised for the lack of warning. Instead of being understanding, Nigel saw this situation as an opportunity to either sue me or rent himself a Chateau at my considerable expense! Nigel was informed that his deposit cheque had been torn up and, obviously, not cashed. It is no surprise to me that he would like to insinuate here that I have kept it. I hope no other owners have the misfortune of having to deal with this aggressive and intimidating bully. Short of handing over the deeds of the house, he would not have been satisfied! I have let this house through HomeAway since the early nineties and most clients regularly return. When I contact HomeAway they think I have made a mistake with the property no. as it is only 3 digits (i.e one of the first houses they promoted) and this is the first time I have had a review like this. Cette maison de famille, simple et authentique, magnifiquement rénovée, nous a ravi du premier au dernier jour! Sa situation isolée est parfaite pour des vacances déconnectées, en petit, moyen ou grand groupe. L'intérieur est bien équipé, et l'extérieur (grande piscine) est parfait pour la détente, lecture, jeu et barbecue. De plus, l'accueil y est discret et généreux. Hâte d'y retourner! Merci pour cette découverte!